Matt's positive attitude and encouragement when it comes to trying something new is infectious. He really is a great role model and wonderful person to ask many questions to about armor and big monster making. Don't forget! It is an odd numbered month, which means Ascension Props is also the centerfold for Utah Geek Magazine! Check here for the magazine online and read about Matt's Top 5 Tips for working with EVA Foam. Local to Northern Utah? The magazine can be found at comic book stores and other geeky avenues. Already with the hard questions! 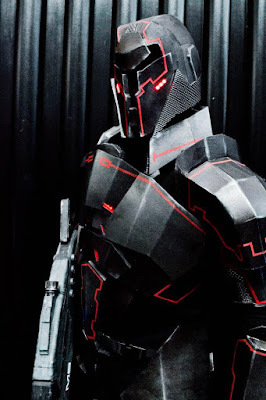 I've been cosplaying for around five to seven years, though I've only really been big into it with the elaborate armors and things for about four years. 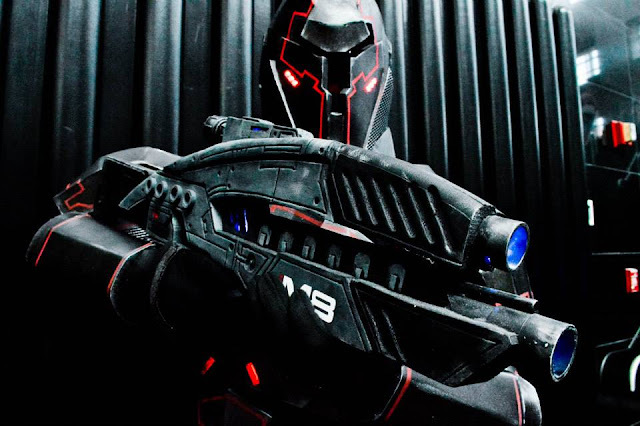 Did you have your skill set for EVA foam work and armor making before starting cosplay? If not, are you self-­taught? own and learned from them. After wearing it that night, there were a ton of improvements I wanted to make to it, and everything just exploded out from there. Fun Note: Mark Meer, voice of male Commander Shepard, is the Vorcha on the right! I follow so many people right now that it's hard to narrow it down! The two big names that really got me wanting to make more and more at the beginning were Harrison at Volpin Props and Bill at Punished Props, both for their own Mass Effect armor and crazy cool prop making skills (and especially since Bill does a lot of foam stuff like me). Eventually following Bill led me to Will at WM Armory, who also does some super amazing stuff with foam. More recently I've really been following the work of Evil Ted Smith, who does a ton of movie stuff (including that big cannon that Bennedict Cumberbatch swung around in the Star Trek film Into Darkness), and Ted Haines, who does some amazing foam fabrication for films as well. What has been the toughest build you have ever made? Ooh, that's a toughie. Every build has its issues, from space necessities, to fumes, to the ever stubborn piece not wanting to bend just right to glue down. While Threshy may have been the biggest I've ever made – and he was definitely stubborn in so many ways – I'd have to say that the Giant Robot build was the toughest. I had six weeks to figure out how to reverse engineer the robot that the Stan Winston School and Legacy Effects made for San Diego Comic Con, with extremely limited tools and lower quality supplies, and make everything pretty much freehand unlike many of my other builds where I have some sort of pattern already. I also had major issues transporting him around, and even though I finished him with time to spare for the convention, several of his parts did not make it there. Huge hit though! 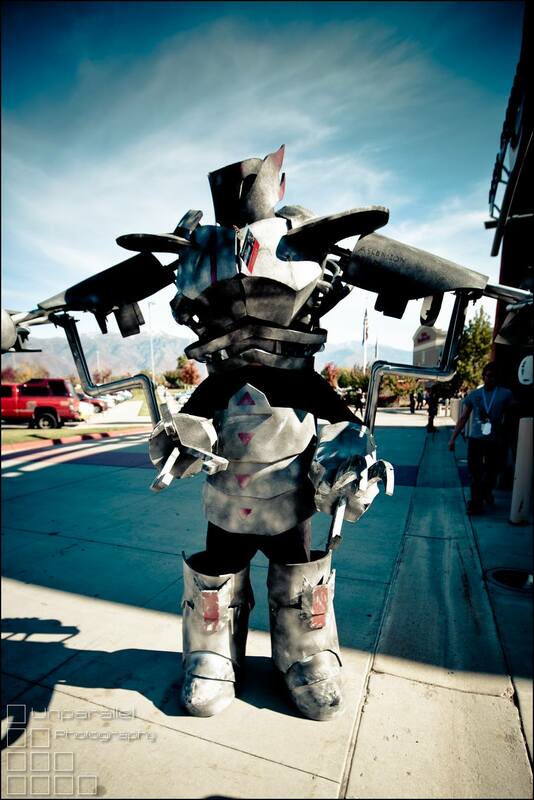 Prop making, armor builds, and massive monsters/robots – which part is your favorite? Honestly, I love all three! I've always loved building things with my own two hands, though the furthest I ever got were small things in Cub Scouts or putting together store ­bought furniture kits. 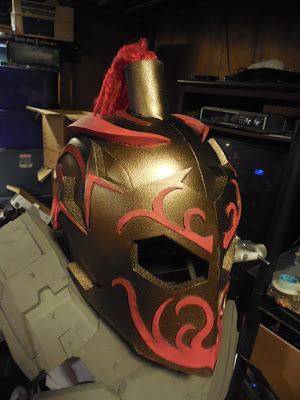 Actually designing and building a set of armor or a prop really brings it all together, and the feeling of fulfillment and accomplishment after completing it is the greatest – every single time. The best part though, is when I wear the builds at conventions and see all the people get excited about it! 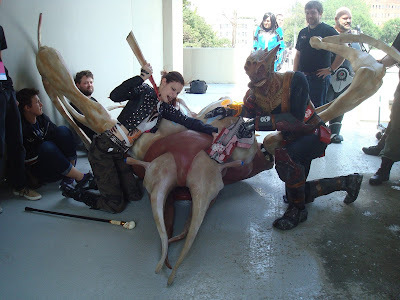 Some love to see their favorite character made real, others love the craftsmanship, and still others are fellow fans dressed from the same universe and suddenly instant group! I always love watching people get excited over something I've made. Makes it all worth it in the end! 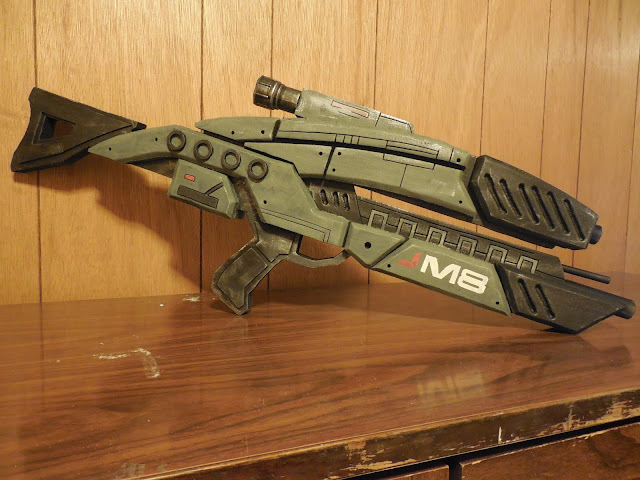 M8 Avenger prop build - made out of EVA foam or floor mats! How long did it take you to build Threshy with your group? Threshy was definitely my craziest build, if not the toughest. Overall, he took about six hundred hours of actual build time, not to mention all the research time I spent on him. His body, made by Keelah Monster Cosplay, took about 25­-30 hours. All of this happened over the course of two months. What was it like collaborating with a team to build him? Honestly it was a blast, though we built our portions entirely on our own. Since we're at opposite ends of the country, we contacted each other as much as we could for measurements and the like, and thankfully it all worked out wonderfully in the end! In a heartbeat! Though, admittedly, it would be much easier to do such a large collaboration with people who live more locally. That way we could actually bring the parts together easier for testing. 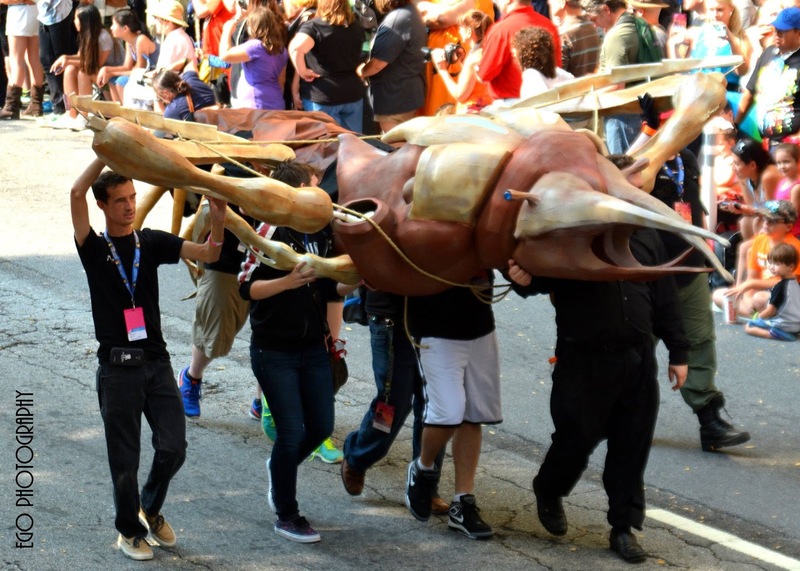 Threshy's head and body came together perfectly in the end, but it was a big worry up until we were able to get them put together literally right at the Dragon Con parade! What advice do you have beginners who want to try EVA foam in their costume or prop builds? Go out and do it! Foam comes in various thicknesses, and you can combine it with other mediums very easily (Kamui Cosplay uses craft foam, which is literally the same stuff but thinner, as a wedge inside of her Worbla builds to add depth and strength). It takes hits well (though your paint job might not), so it works great at conventions – though be warned that it gets hot. All in all though, try it out! If you've wanted to make something for a while but you're not sure where to start, pick up some foam and go at it. It's a great primer to the world of cosplay!